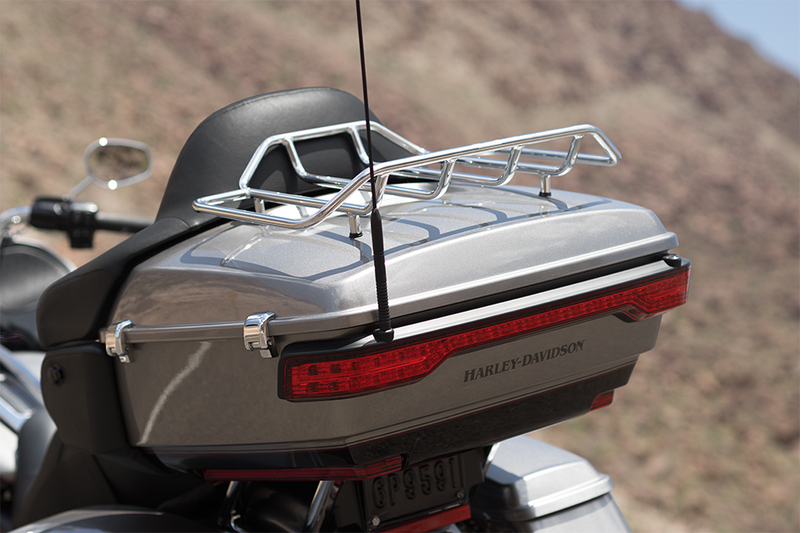 The Harley-Davidson® Road Glide® Ultra is one of the most popular members of the Harley-Davidson® Touring lineup. It’s designed to provide comfortable, safe, and smart riding for those who call the Los Angeles and Inland Empire area their home. The 2016 Road Glide® Ultra provides the long haul tourist with every smart feature and design element necessary – plus that classic Harley-Davidson® bagger style. 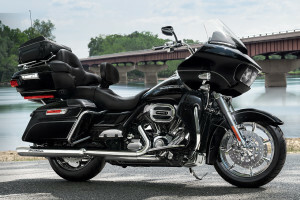 Check it out at Riverside Harley-Davidson® today! 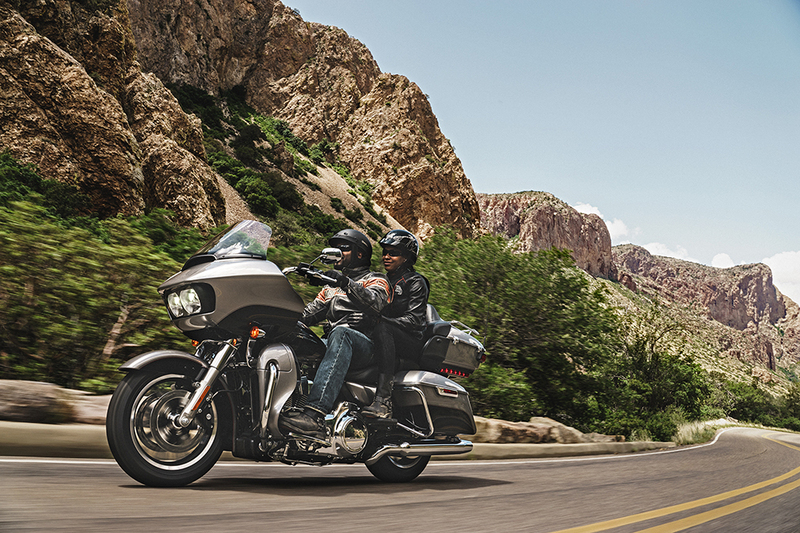 The Road Glide® Ultra comes with the right touring features to keep you in control on any ride. Brembo® Brakes: Dual front rotors work with a four-piston caliper in the front and rear to give you the kind of stopping performance that you can trust. H-D® Smart Security System: When you step away from your Road Glide® Ultra, you can relax. It’s protected automatically with this smart security system thanks to the included handsfree keyfob. ReflexTM Linked Brakes with ABS: You can confidently brake with less chance of locking up either wheel thanks to the linked, antilock brake system that comes standard on the Road Glide® Ultra. Dunlop® Multi-TreadTM Tires: These high performance tires deliver both the long-haul durability you demand and the cornering performance you need. Six-Speed Cruise Drive® Transmission: This smart transmission provides smooth, quiet shifting, and an isolated drive system makes acceleration smooth and linear. Twin CooledTM High Output Twin Cam 103TM Engine Innovation: The V-Twin design might have a long history, but this engine features modern parts like lightweight alloy pistons and electronic fuel injection to deliver contemporary performance. The Road Glide® Ultra comes standard with the latest in infotainment features. 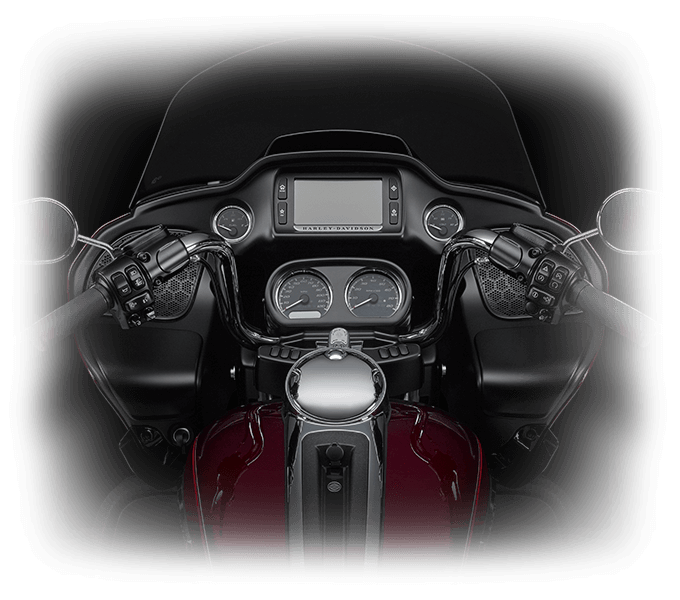 6.5-inch Touchscreen: With bold, bright graphics and intuitive controls, this system gives you access to all the infotainment features you want. Boom!TM Box 6.5GT Radio: This radio unit delivers amazing volume and clarity, and it automatically adjusts the bass, treble, and volume to match your speed. Jukebox With USB Port: Plug in your smartphone or other device and you can easily stream audio, recharge, and even control it with voice commands and hand controls. 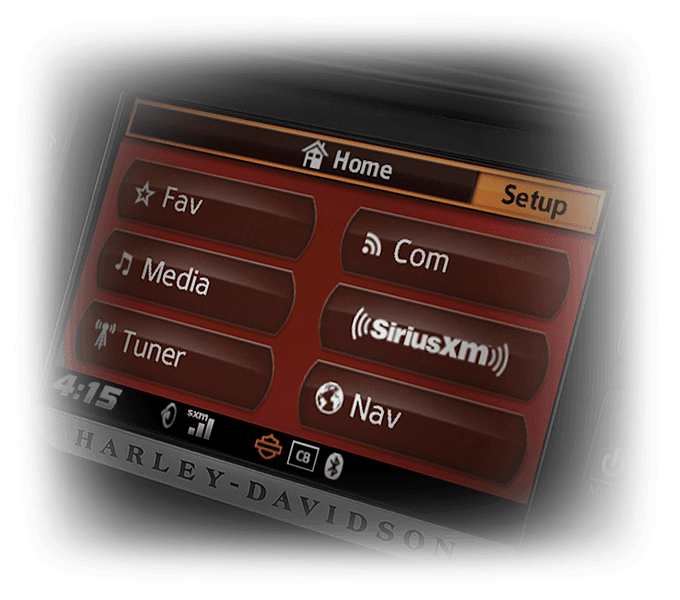 Handsfree Infotainment: It’s a breeze to take advantage of your navigation system, smartphone features, and more with just a word. 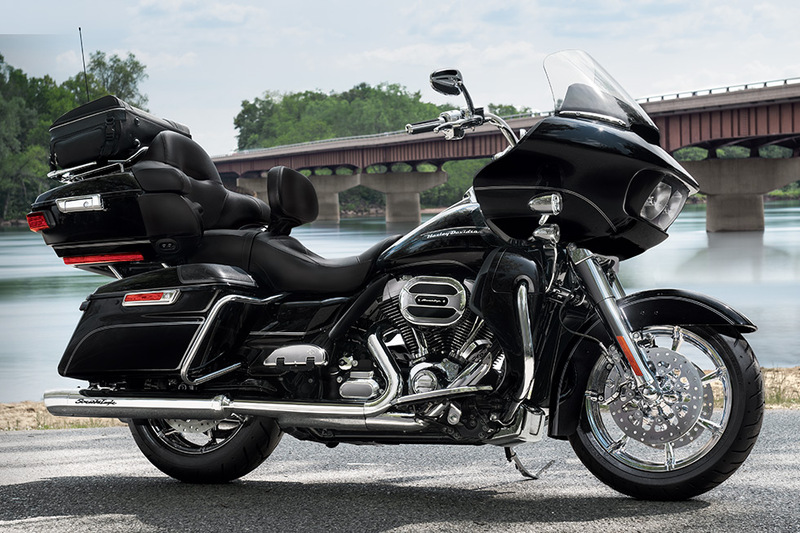 The Road Glide® Ultra is designed to deliver comfort and style for a truly premium feel in an authentic touring motorcycle. 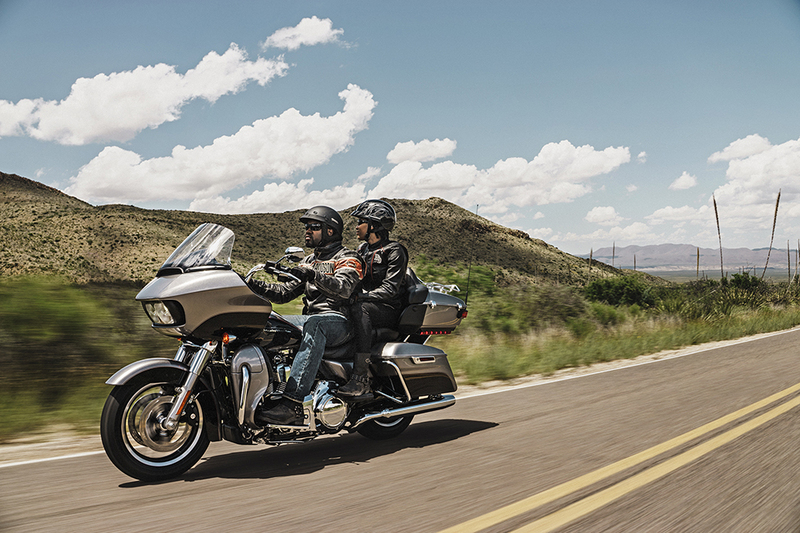 Back and Arm Rests: You know you want your rear passenger to be comfortable on the longest rides. With back and arm rests, it’s easier for them to relax. 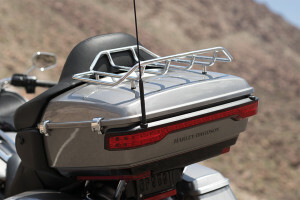 Fairing Lowers: When you’re in the saddle all day, small issues can become big problems. 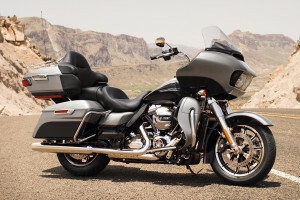 The fairing lowers are designed to provide coverage from wind and road debris, but they also offer vents to let some air in when it’s hot. Increased Passenger Seat and Leg Room: The rear seat passenger can relax with more space in back than ever. There’s more seat space and more leg room. Fairing Design: The fairing design is the product of thousands of hours on the highway and in the wind tunnel. The current fairing helps reduce head buffeting and fatigue. 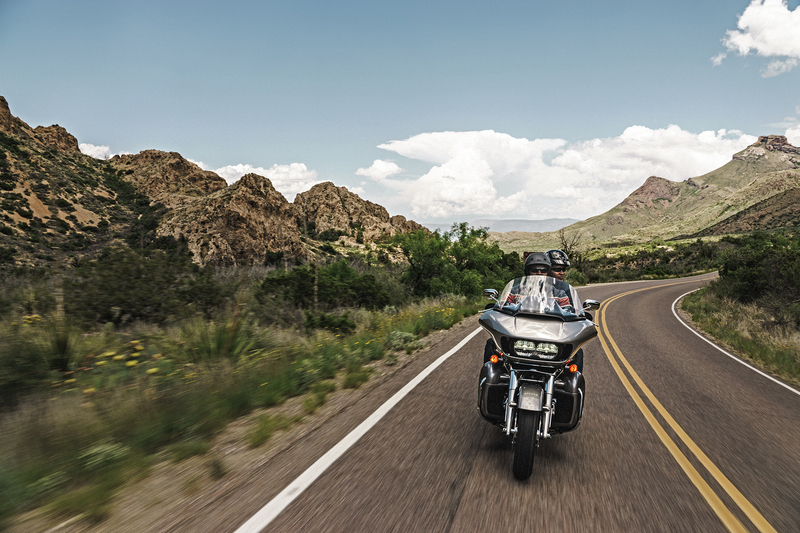 One-Touch Design Philosophy: To make your life easier, the Road Glide® Ultra is designed to make everything simpler. 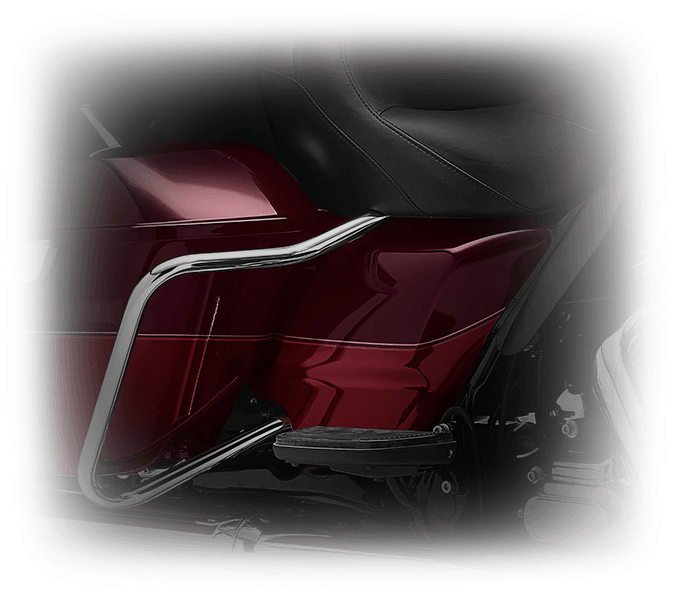 One touch opens both the saddlebags and the fuel door. 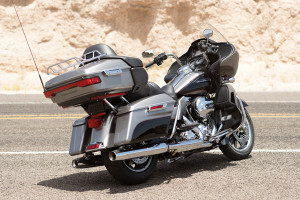 Tour-Pak® Luggage Carrier: The big luggage carrier delivers good looks as well as space to securely store two full face helmets, and the chrome rack on top offers added capacity. Two-Up Touring Saddle: This stylish, sculpted saddle offers a deep bucket and narrow neck to provide plenty of comfort and relieve pressures. That makes it easy to ride all day. Full Length Footboards: Full length floorboards with rubber isolation provide comfort for the long haul. 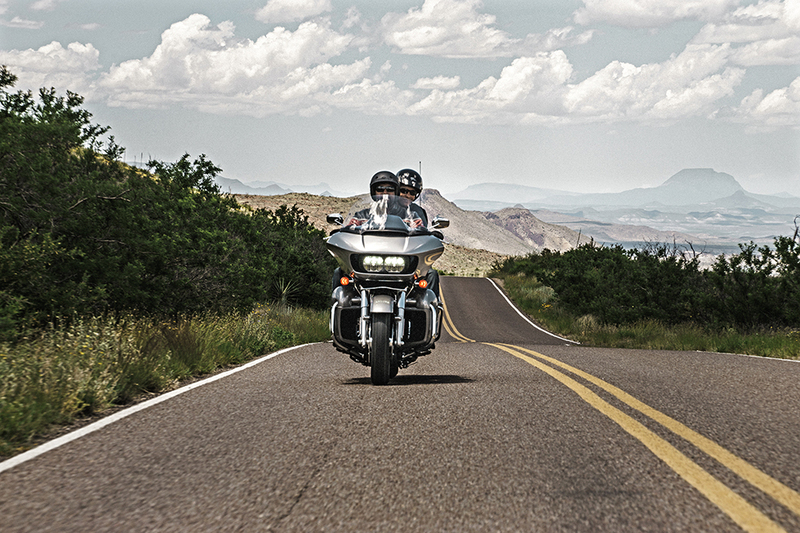 Standard Cruise Control: Cruise control makes it easy to eat up miles on the longest roads, and it comes standard on the Road Glide® Ultra. The Road Glide® Ultra isn’t just about function – it’s also a great looking bike. 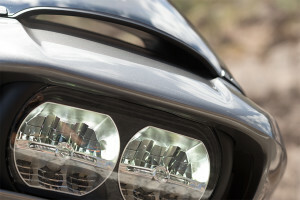 New 13.5-inch Custom Windshield: Keep flying insects and road debris away from your face with this new tall windshield. 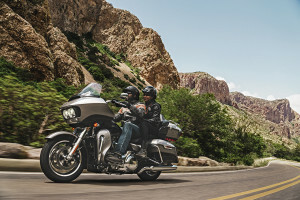 Restyled Fairing, Saddlebags and Front Fender: The new styling for the Road Glide® Ultra provides a completely modern, aggressive, seamless look. It flows from the front fender and fairing to the back of the Tour-Pak® luggage carrier. 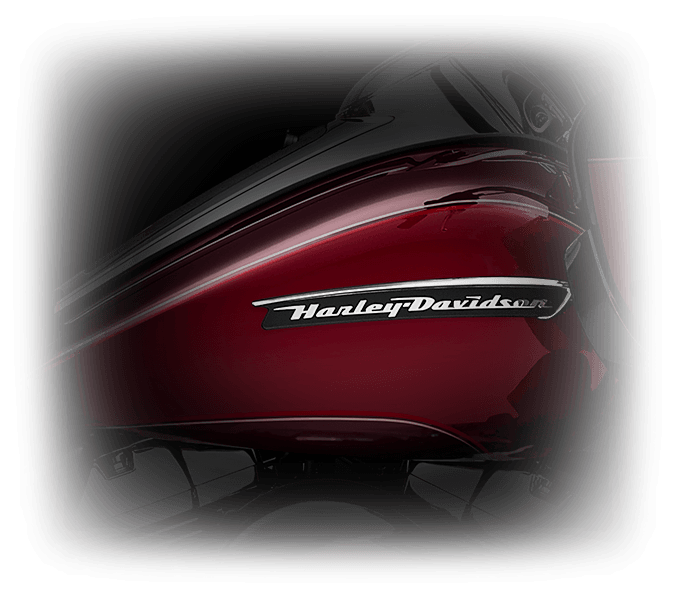 Classic Fuel Tank: The unmistakable Harley-Davidson® fuel tank provides space to show off your premium paint and bold chrome badging. It also holds six gallons of fuel for impressive range. 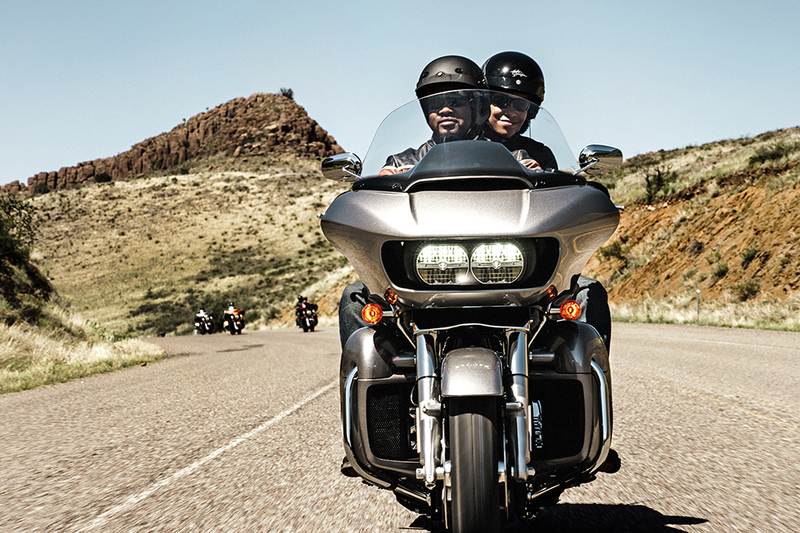 Combination Stop/Turn/Tail Lights: To keep you safe and keep a clean aesthetic out back, the Road Glide® Ultra gets combination lighting. Impeller Cast Aluminum Wheels: These head turning wheels are made of lightweight cast aluminum in a ten-spoke pattern, and they feature both polished and black finishes. 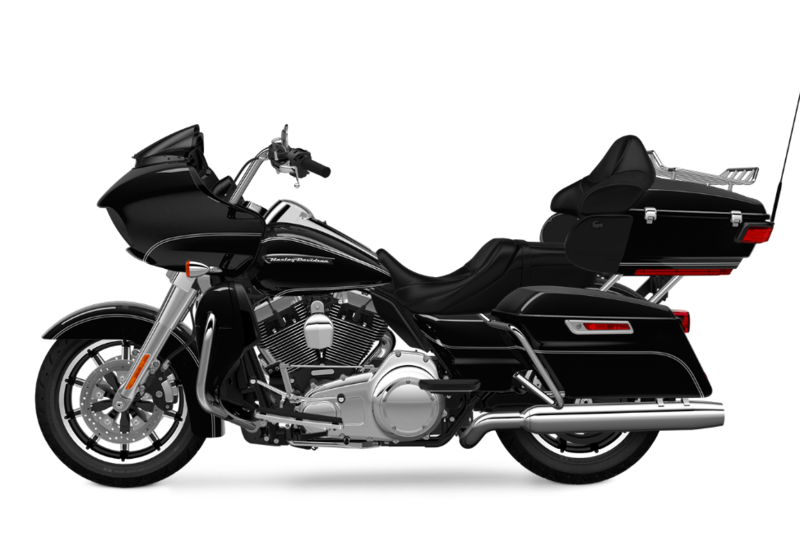 Pure Harley-Davidson® Styling: The big V-Twin at the heart of the Road Glide® Ultra looks great with a chrome air filter cover, machined cooling fin tips, High Output 103TM badging, and black powder coated cylinders. 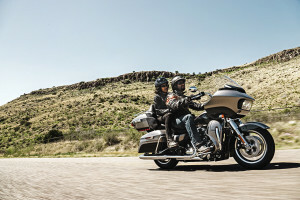 Badging: The Road Glide® Ultra comes with beautiful, polished metal badging on the tank and fender, because the badges should be built to last just like the rest of the bike.